The Chinese company-lessee of Hambantota Port is refusing to release the final lease rent of US$585 million to the Sri Lankan Government unless a man-made island – which has been built as an entertainment facility off Hambantota – is also given, as part of the deal. In a related development, this time from the Sri Lanka side, the Government is hoping to re-negotiate the contract to reduce or remove the tax breaks and concessions. This is likely to trigger another round of protracted negotiations which could further delay disbursement of the final tranche. Economists said this money is badly needed for state coffers and to boost reserves. 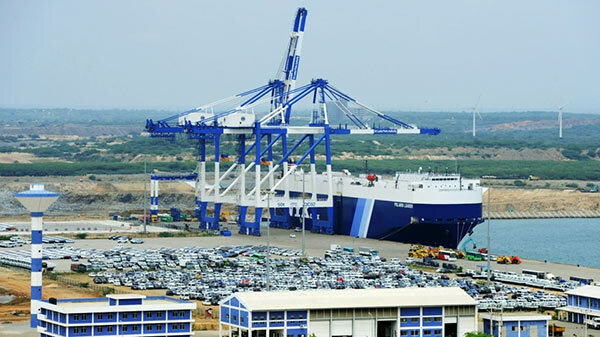 Informed sources said that China Merchants Port Holdings Company (CMPort) Ltd is likely to delay the release of this final sum of the long lease of the Hambantota Port which is due in the second week of June if the Government fails to meet its obligations and commitments in accordance with the lease agreement. In July 2017, the Sri Lanka Ports Authority (SLPA) leased out the Hambantota Port to CMPort for a 99-year period at price of US$ 1.1 billion. A sum of $292.1 million has been credited to the US dollar account of the Government maintained at the Central Bank in December 2017 as the first lease payment out of the full amount of $ 973.7 million from the transaction with the SLPA. Thereafter on January 14, another payment of $97 million was made as the second tranche. The SLPA has built this artificial island in the extent of 110 hectares near Hambantota Port at a cost of over $500 million during the previous Rajapaksa regime. The project was funded by the China Exim Bank and the contract had been executed by the China Harbour Engineering Company. The relevant gazette notifications declaring the man-made island as a land belongs to Sri Lanka government and granting tax concessions to the CMPort are yet to be issued owing to certain legal and administrative issues, official sources said. The Chinese company will have to be granted with a 25-year corporate tax holiday, which commences seven years after the lease agreement’s signing, thus extending the tax break to 32 years. Other tax concessions include exemptions from dividend tax for 26 years, withholding tax for seven years, VAT for seven years and Port and Airport Development Levy for seven years. It will also be exempted from CESS NBT, Excise and customs duty on the import of project-related items and expatriate staff will be exempted from PAYE, for seven years. However under the New Inland Revenue Act in force since April 2018, tax concessions have been curtailed to the maximum and the Treasury is losing massive tax revenue if the Chinese company is provided with those tax breaks, a senior government official said. He added however that this matter cannot be renegotiated with CMPort as the government has already entered into an agreement to provide such concessions. But the Treasury was not in a position to bear such a massive revenue loss due to cash flow issues, he said adding that this matter should be settled through consultation compromise and consensus. The Government has to pay a large sum of money as capital and interest installment to the Exim Bank of China for the four separate loans amounting to around $1.2 billion taken for the construction of Hambantota Port at interest rates of 6.3 per cent for one tranche and 2 per cent for three other tranches. The total amount that has to be paid for the Hambantota port was $1.2 billion capital + $495 in interest totalling $1.7 billion by 2036. The government has paid around $500 million by the end of 2016 as capital and interest installments, Treasury records showed. The debt repayment for a sum of $147 million to the Chinese Exim Bank out of the total amount of $1.2 billion will commence soon this year. The annual repayment would be around $96 million. The port’s total income has been $16.5 million (Rs. 2.4 billion) since 2015 and it is operating at a loss of Rs.37 billion. It is ironic that Sri Lanka is having problems with dealing with the Chinese when the Chinese are involved in global contracts running up to billions of dollars. In contrast sri lankans ever since independence had been pan handlingfor few billions here and there just to bridge the balance payments and then begging for aid from natural dsasters. The Agricultural sector is in dire stratiighst for want of seed material to plant the next season and then fertiliseras and other inputs. At onetime The DoA was boasting of yields of over 100 bushels per acre and now they would be ard pressed to produce the budgeted targets and will be forced to import rice in addition what we could muster from charity. Sri Lanka has the capacity and the expertise to deal with large sums of money as investments and loans. Unfortunately, the entire population in the South is corrupt to the core. The DoA has some qualified officers and many political appointees with nothing upstairs. The entire system in DoA is geared towards distribution of subsidised seed and subsidised fertiliser. There runs the corruption from top to bottom; the farmers who don’t palm the pagawa never receive their entitlements. Before we embark on dealing with economic issues, we should embark on dealing with corruption. Like President Duarte in the Phiilipines who implemented the death penalty for drug dealing, SL should implement death sentence for corruption, at least for a period of time. 118 representatives in the big house who allegedly received money from Aloysius should be queuing towards the hangman’s rope before Dec 2018.